TUCSON - A federal judge found four humanitarian aid volunteers guilty on some of the charges against them for dropping off water and food for migrants at a protected wilderness area along the Arizona-Mexico border, notorious for the number of human remains recovered each year. U.S. Magistrate Judge Bernardo Velasco found Natalie Hoffman, a volunteer with humanitarian aid group No More Deaths, guilty on all three charges against her. He also found three other volunteers - Oona Holcomb, Madeline Huse and Zaachila Orozco-McCormick - guilty of the two charges they each faced. In a statement, Catherine Gaffney, a longtime volunteer with No More Deaths, criticized Friday's ruling. The U.S. Attorney's Office in Arizona, which prosecuted the case, has not responded to requests for comment. Prosecutors with the U.S. Attorney's Office in Arizona presented a factual approach, arguing the four women on trial admitted in court to having willingly violated the refuge's regulations for which they were charged. "I was there to leave water," Hoffman said, when asked why she didn't sign the document. Defense attorneys also claimed that the federal government had singled out No More Deaths, arguing that the volunteers for the organization faced many hurdles that other members of the public didn't. Prosecutors argued that the 10 rescue beacons that the Border Patrol installed inside the refuge was the "preferred way to save lives," rather than dropping off water jugs with gave "false hope" to migrants, Assistant U.S. Attorney Nathaniel Walters said. 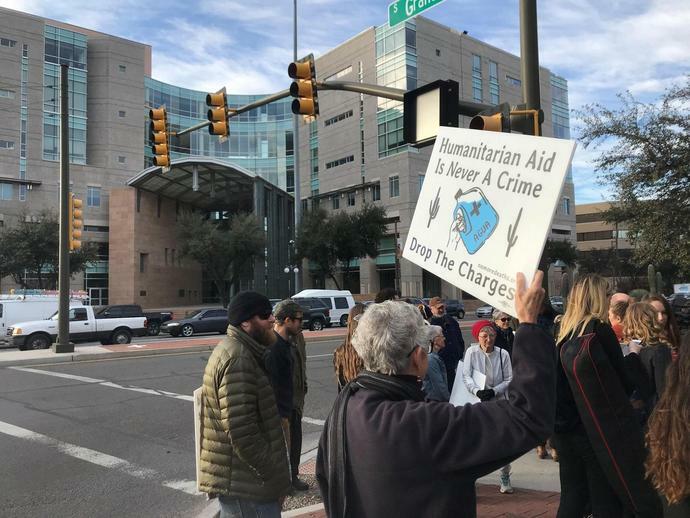 Friday's verdict is the first conviction against humanitarian aid volunteers along the U.S.-Mexico border since 2009, when a federal judge found another No More Deaths volunteer guilty of littering for dropping off water jugs at the Buenos Aires National Wildlife Refuge, west of Nogales. The Beavers rack up 13 hits and score three runs in the first inning to beat Arizona 9-3 on Saturday, securing the series sweep. Adley Rutschman and Elliot Willy each had three-RBI games for OSU, which has now won 13 of its last 14 Pac-12 games.